I remember that some eyebrows were raised when we first announced our decision to be based in Bermuda. Even the professional services firms we engaged with to get ourselves started were forced to do some careful thinking. This wasn’t part of the normal playbook, you see. Very few international businesses start up offshore. But as our advisors thought it through and examined the angles, they became more and more enthusiastic. It boils down to this: when you’re structuring a company and you don’t know what the future holds, or where your funding is coming from, or how best to split the equity among founders and advisors, or how or where you’re going to be generating your future revenues, it’s very handy to retain a bit of flexibility. Bermuda’s corporate tax neutrality allows us to defer having to make any decisions which might have corporate-tax consequences until we know how and where we’re going to be paid for the products we build and the networks we operate on behalf of our clients. Since we’re building and operating enterprise blockchain networks, which could include novel incentive mechanisms for enterprise participants providing specific [but at this stage undefined] value to the network, this type of flexibility is a wonderful thing. Obviously, there are some complex issues to be considered around tax management and how and where IP is developed and commercialized. 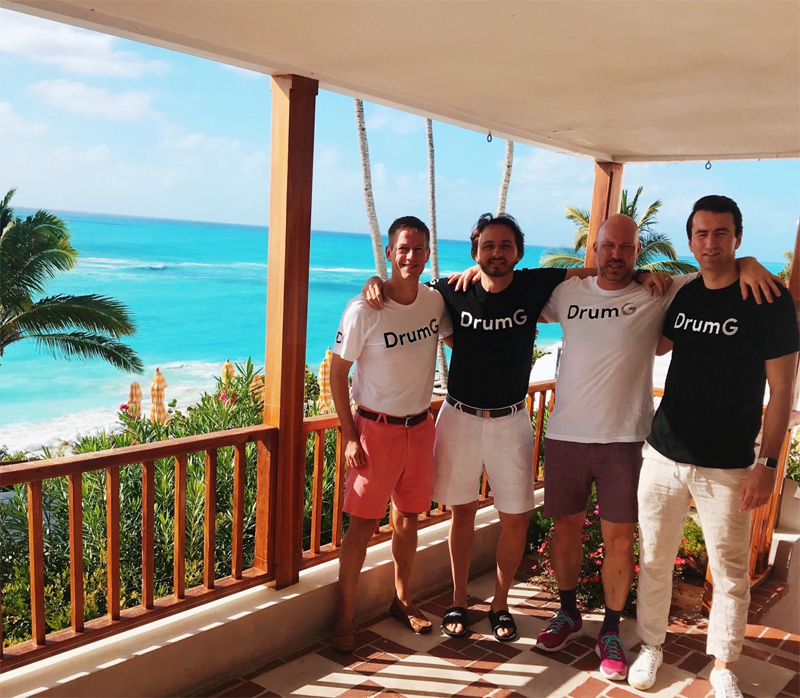 For DrumG, we just knew we were going to create a global business and we decided that learning about all this stuff up front would be essential to maximizing our future enterprise value and maintaining operational flexibility. Frankly, having a tax optimization model for a pre-revenue start-up might seem irrelevant in the short term, but it has the potential to be hugely important over the longer term. We decided we needed to determine how we want to operate our business and then fit the tax model to this scenario. Bermuda is the perfect place to park while we figure this all out. Bermuda boasts a very sophisticated professional services market so it was pretty easy to stand ourselves up quickly and correctly. Many start-ups skip this step and do their corporate structuring on the back of a napkin, but it’s very difficult to retro-fit good corporate governance and when you do end up in serious conversations with major institutional investors, having a bullet-proof structure for investment side-steps a lot of headaches. What’s more, many of Bermuda’s internationally renowned firms [Big 4 consulting, multi-jurisdictional law firms, outsourced accounting and payroll etc.] have embraced the new world of fintech and have already created practices catering to start-ups. Nowhere will anyone claim that good professional advice comes cheaply, but at least in Bermuda we found prices were reasonable and support was highly personalized and very attentive. Did we end up paying more than we would have done if we had simply incorporated a Delaware company and based ourselves in the US? There can be no denying it. In the grand scheme, does this additional expense matter? Perhaps, but we see it as a calculated option. Do we think what we paid is worth it and would we do it again? Absolutely. Bermuda’s corporate process is closely modelled on the US paradigm, which is great, because when you inevitably have a US lawyer [or two] on either side of your funding transaction, their ability to communicate with your Bermuda-based counsel is pretty key. Having watched the painful [and expensive] battle of the drafts from the safety of the sidelines, I was struck by how easy localizing everything into the Bermuda context seemed to be, from the final tweaks to the standard US closing docs to the employee incentive plan and share-purchase agreements, it didn’t take much or long for our Bermuda counsel to add the finishing touches. So why do I call Bermuda the Innovation Nation? Perhaps, with the benefit of having lived here for five-plus years, I’m at an advantage when navigating the international business community. That said, every colleague I have brought here to explore the island ecosystem has loved it. It is just so easy to get the right people around a table to have a productive discussion about building something. For a technology like blockchain, which is designed to solve collective action problems and provide the foundation for new types of business alliance, getting the right people around a table is an important piece of the puzzle. Bermuda is also home to many “right-sized” financial companies to collaborate with to demonstrate the business value of our technology. These companies often have strong businesses with multi-jurisdictional reach and are able to make decisions quickly and autonomously. Talking of nimble powerhouses, Bermuda’s [re]insurance industry is globally significant and at the heart of Bermuda’s innovative credentials. For the uninitiated reader, this might sound like hyperbole, but despite its tiny population, Bermuda is a big player. There is something about this we love. The Bermuda market probably shouldn’t exist, but it does. It confirms all our theories about how complex dynamic systems work in practice: how peripheral players who become experts in something the rest of the world doesn’t quite understand, can accrue outsized influence. One of our Advisors, Professor Gordon Hewitt, often refers to companies that have changed the game by thinking big — even when they’re small — as “nodal players”. Bermuda is the quintessential nodal player. Innovation is in Bermuda’s DNA. When you’re out on your own in the mid-Atlantic, you have to get creative to continue to grow and prosper. New [re]insurance products and services are brought to market more quickly than anywhere else because the business community understands the need to be collegial: “We’re truly a market of friendly competitors,” the now-CEO of AIG once told me. All of this is shored up by a pragmatic and approachable regulator in the form Bermuda Monetary Authority [BMA]. If you’re already active in the blockchain space, you’ve probably noticed Bermuda’s government-led desire to participate in this new economy. For the start-up entrepreneur, the ability to access the highest echelons of government is a huge boon and we have been constantly impressed by the intelligence of the Premier and his team. They understand the magnitude of the opportunity and they have been able to make some sophisticated decisions regarding innovation in both financial technology and emerging asset classes. Not every idea will stand up to scrutiny, and this is why the BMA has recently created a sandbox environment for start-ups to test their innovations. In this way, the regulator can ensure each innovation conforms to the appropriate standards before being unleashed into the market to further enhance Bermuda’s global platform for doing business. We have enjoyed all of our interactions with both the government and the BMA, and while DrumG is not currently looking to develop technology solutions that need regulating, it’s nice to know we have been able to create a relationship with these key stakeholders in an emerging ecosystem which the Premier and his team hope will grow to be as globally significant as the reinsurance industry. So, what’s it like to live in Bermuda? Do you really need to ask when you see pictures like this? It still gives me a thrill to be able to get on my scooter in the morning with some hand luggage, make an 8am flight, and meet with my colleagues at our office in New York City at 11:30am. It’s even better to come home. As we say in Bermuda, “Quo Fata Ferunt” — wherever the fates lead us. 09 Sep: What Happens To Your Pension When You Die? You’re all cozy with Premier Burt at the moment but don’t ask him for status!! Ha ha ha!! ^^What real Bermudian^^ would make a cheap attempt to undercut their own Gov’t's efforts? I swore it was only PLP supporters that allegedly did this? And what does Bermuda Status have to do with this story, goes to show exactly where some of your heads are at..
Did I say something factually incorrect? Methinks not, just pointing out the hypocrisy of the PLP and giving these guys the full disclosure of what they can expect from Bermuda. It’s not unpatriotic to question the Goverment. In actuality it’s very healthy . Don’t you find it strange that the author of this column is trying to pitch Bermuda to Bermudians. Smells a bit like propaganda, don’t you think. Perhaps that explains 2 Bermuda’s snarky post.